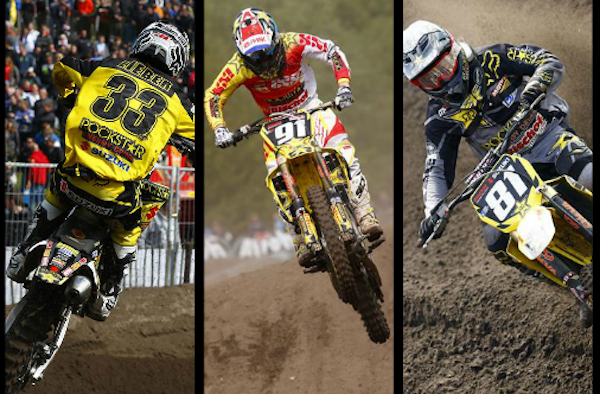 Rockstar Energy Suzuki Europe faced the Grand Prix of the Netherlands without principal star Glenn Coldenhoff, but riders Julien Lieber and Jeremy Seewer gave a good account of themselves through the tough Valkenswaard sand with Lieber scoring his best season result. The shallow sand was bumpy and ruthless in some sections due to the presence of five racing classes throughout the weekend. The sun shone on the sixth round of the FIM Motocross World Championships and 27,000 spectators came-out to enjoy the weather and some first-class racing action. Seewer made a fantastic start in the first moto on the RM-Z250 and was running in third position. A slew of riders disputed slots in the second half of the top-10 and Lieber burst through to secure seventh place as the young Swiss found his rhythm further back in 11th. It was Lieber’s highest finish of the season so far and since the same meeting in 2013. In the second race Seewer was driven wide into the fast left hander before the run to the finish and crashed in what was the early stages of the moto. He picked himself up but the bike was quite badly damaged, but he pushed-on to take one point for 20th. Lieber was also on the ground on the first lap. A mistake trying to turn too tight meant he quickly had to pick up the RM-Z and get back into the fray. Again his riding was strong and he broke into the top ten for ninth-place overall. Coldenhoff was still nursing pain from his recent knee surgery so could not be present at his home Grand Prix to receive the attention of the fans after a stellar start to the 2014 campaign that delivered three podium finishes. Brian Hsu was in attendance for the third round of the EMX125 championship and had an eventful meeting. The youngster was fighting for second position in the first moto until a short landing on a jump saw him tweak his groin and he had to slow to seventh. Three crashes in the second moto banished him out of the points and down to 28th, culminating in 15th overall. Rockstar Energy Suzuki Europe will eat kilometres this week in the journey from northern Europe to Spain and Talavera de la Reina circuit that is preparing to welcome the FIM MXGP series for the first time in 14 years.